It was an amazing trip full of music, dancing, friendships, an engagement, a loss and a lot of memories. 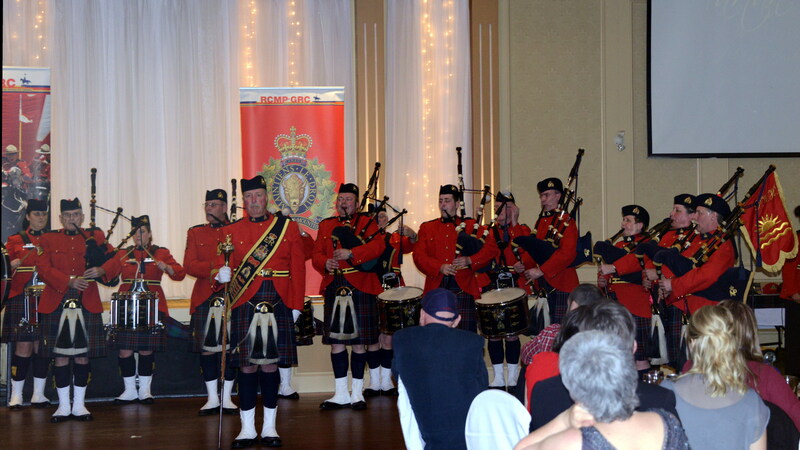 It’s been a busy few months for the RCMP E. Division Pipe Band, with new folks, new equipment and plenty of piping and drumming. Earlier this spring, the band celebrated the acquisition of a new band mace, following a successful “Raise the Mace” fundraising campaign last year. 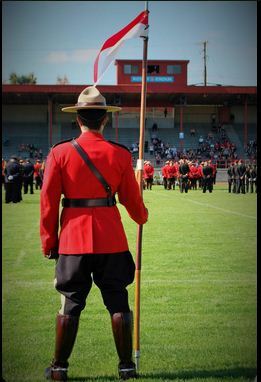 Our new mace, carried by the Drum Major at all parades and events, holds all the names of fallen members of the RCMP and North West Mounted Police. It’s an important symbol of the regiment, honouring those who have fallen in the line of duty. The mace-presentation ceremony was attended not only by Deputy Commissioner Craig Callens, Commanding Officer, E Division and Sergeant Major Dave Hall, but also the entire E. Division headquarters, who turned out on a beautiful spring afternoon to hear the band and witness the turn-over of the mace to Drum Major Mike Guillimin. You will see the mace any time the band is performing or marching in a parade. While our colleagues in the East are thinking about a possible end to a long and snowy winter, our thoughts on the west coast are turning to daffodils, cherry blossoms and spring concerts. 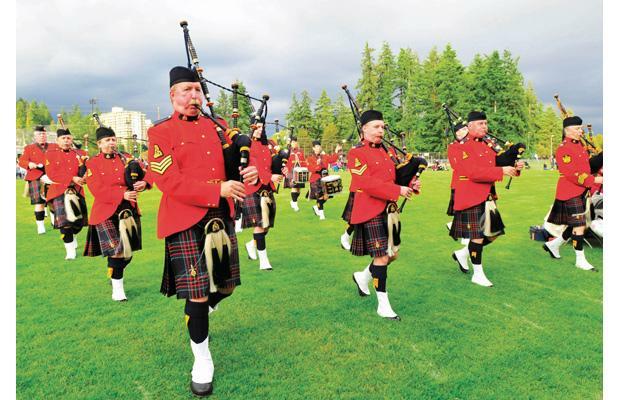 And with International Tartan Day landing smack in the middle of this early spring, the RCMP E. Division Pipe Band is again planning to celebrate. Merry will lead the band through their paces. The professional dance troupe Shot of Scotch (Vancouver) Highland Dancers will also participate in the ceilidh with a number of performances. There will be a silent auction, whisky tasting and of course a full meal followed by dancing. A great crowd and appreciative audience. 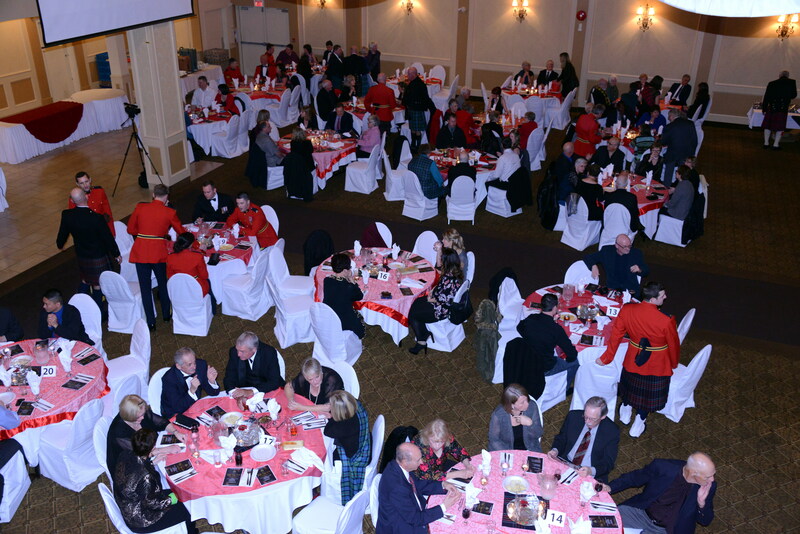 enjoy a great spring evening in the Lower Mainland while celebrating all that is great about our Scottish (and tartan) connections. We’ve all seen it; a pipe band marching towards you, the skirl of the pipes and drums echoing off the hills or buildings, and leading the band; the drum major carrying the regimental mace and the decorations of the regiment across his or her shoulder. Drum majors have been a part of the British Army for almost 400 years. It began with a fife and drum corps, under the direction of a drum major, providing signals to various field units during battle. When not directing music during times of war, the DM would often be responsible for delivering justice among the ranks, administering whatever flogging needed to be done. Oh, and he delivered the mail. This is normally the time of the year when many (non-competitive) pipers and drummers are packing away their instruments, grabbing their umbrella’s and coolers and heading to the beach for some R&R. After months of practice, the spring and early summer months bring the highland games, parades and performances with the latter part of summer a time to take a break. 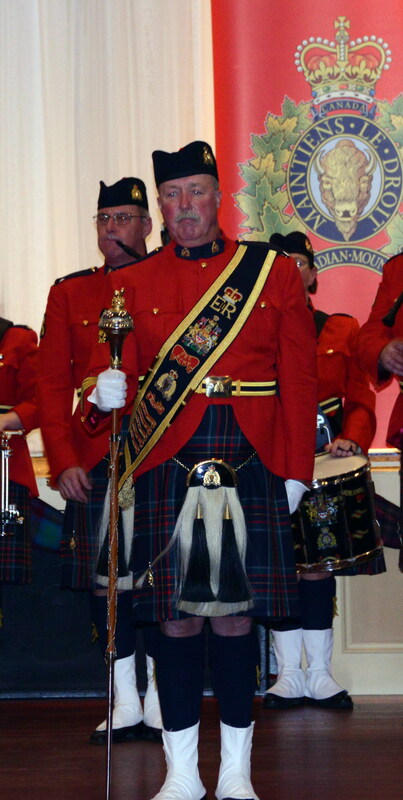 Not so, for the RCMP E.Division Pipe Band. This upcoming weekend, the band is making the five hour trek to the interior to participate in the Okanagan Military Tattoo. Now most people who read this blog are likely familiar with a military musical tattoo. 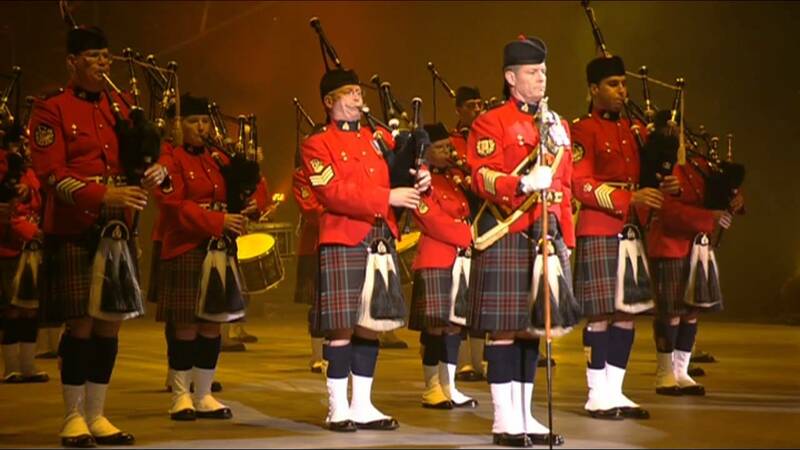 So, for the uninitiated … a musical tattoo is a demonstration of military drumming, piping and skills. It’s called a ‘tattoo’ because when the British Army was fighting in Belgium 300 years ago, soldiers were called in from the pubs each night for curfew, or Doe den tap toe, Dutch for ‘Turn off the tap’. There is of course the granddaddy of tattoo’s, the famous Royal Edinburgh Military Tattoo each year in Scotland. 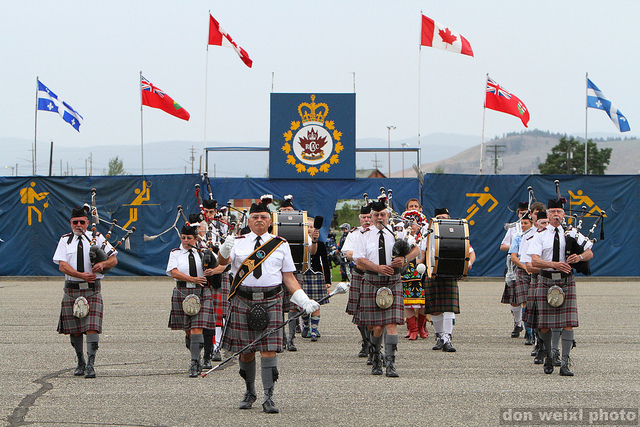 Nova Scotia hosts its own Royal Nova Scotia International Tattoo in July, and this year, the Okanagan Military Tattoo will be added to that list. Hundreds of dancers, musicians, pipers and drummers will participate in the inaugural Okanagan tattoo at Vernon’s Kal Tire Centre. Performances are scheduled for Friday evening, August 1 and Saturday afternoon, August 2. 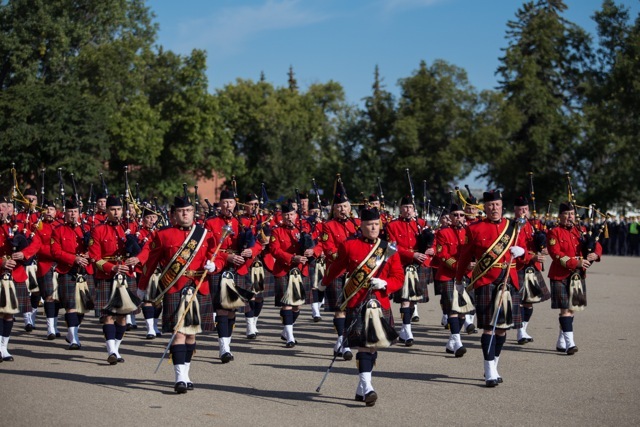 Other pipe bands participating in the tattoo include the Kalamalka Pipe Band and the Aaron Campbell Memoiral Pipe Band. The Royal Canadian Artillery Band has already arrived and has been practising at Silver Star Mountain, one of the major sponsors of the event. For a complete list of other performers, click here. For further information and/or to buy tickets, please click here. Saturday, August 2, 2014 Matinee. Doors open 12:30 with show at 2 PM. In the world of pipe bands, there are only a few occasions when both competitive and performance pipe bands play together. The June 14 “Bagpipes by the Beach” in West Vancouver is one of those rare occasions. Getting together, feeling the music…and the cold.